Posted 1/5/2016 4:36pm by Josie Hart. It’s a new year and it’s renewal time! Thank you so much for making last season incredibly special. Since you are a returning member, you have first crack at renewing. We will open shares to the wait list on February 1. The vegetable share is $500 and feeds 3-4 people. Please consider purchasing an $825 Supporting Share to help fund our Veterans Farm Program. Your support is crucial to this program which provides opportunities for veterans to develop job skills, learn how to operate a farm, engage with different communities, create relationships among other service members and receive monetary compensation for their work. - Egg Share: 20 weeks of free range eggs from Eastern Plains Natural Food Coop. - Fruit Share: 11 weeks of local, organic fruit including cherries, peaches, pears, plums, and apples. - Fresh-cut Flower Share: Get a bi-weekly fresh cut bouquet from our cutting garden. Flowers include dahlias, zinnias and snap dragons. - Jam Share: Six jars of organic, locally sourced or foraged jam/spreads delivered in the fall from Modern Gingham. Please click on the link to get started: Buy your share now! Thank you so much for your support and we look forward to seeing you in spring! Posted 10/20/2015 5:26pm by Josie Hart. TODAY! We have Chatfield's very own lavender bunches for sale. Varieties are mixed and each bunch is just $5! The dried bouquets were grown and harvested by our Chatfield horticulturist, Angie Jewett who designed and installed the lavender this past spring. Please bring cash or check. Contact Everitt Farms with additional questions! The last two distributions of the season, November 3rd and 5th will be a holiday sale! We are featuring herbal products and holiday gifts from Zoe Williams (CSA member), Earth Links, Angie Jewett (Chatfield) and more! Please support the local economy by purchasing gifts for your friends/family from the Chatfield community! Posted 9/25/2015 2:13pm by Josie Hart. 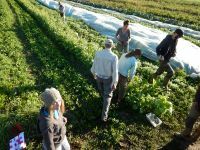 Come on out to the farm this Saturday for another GLEANING DAY! We'll have beans, kale, chard, basil, tomatillos and leeks. When you arrive, park in the main parking lot and head over to the CSA washstand. Follow the dirt road out the small hill and turn left towards the rest of the park. Follow the dirt road down the "staff only" section. On your right will be the pond, then bee hives. To your left, as you are passing the corn field, you will see a large gate that is open. Turn left and head into our far fields. You will see our staff working and there will be signs attached to the crops that you can glean. MUSHROOMS - There will be a variety of mushrooms for sale this week! Including lion's mane, oyster, cinnamon button and shiitake. Please bring $5 to purchase a bag. HONEY - Stock up now on honey for the winter! Jars will last throughout the winter/spring stored in your pantry where it is cool and out of direct sunlight. If your honey is open and crystallizes slightly, just run jar under warm water for a minute. Heat oven to 375 degrees. Oil a 2-quart baking dish or gratin. Blanch chard: Bring a large pot of water to a boil while you stem and wash the chard leaves. When the water comes to a boil, salt generously and add chard leaves. (Set aside stems for another use, or discard.) Blanch 1 to 2 minutes, until tender but still bright. Transfer to a bowl of cold water, then drain thoroughly and squeeze out excess water; chop medium-fine. Heat 1 tablespoon olive oil in a medium skillet and add garlic. Cook, stirring, until fragrant, 30 seconds to a minute, then stir in rosemary, thyme and chopped blanched chard. Season with salt and pepper and stir over medium heat until chard is nicely coated with oil, about 1 minute. Remove from heat. In a large bowl, beat together eggs, milk and 1/2 teaspoon salt. Stir in chard mixture and Gruyère. Stir in corn and mix well. Scrape into prepared baking dish. Sprinkle Parmesan over top and drizzle with remaining olive oil. Bake 35 to 40 minutes, until nicely browned on the top and sides. Allow to sit for at least 10 minutes before serving. Blanched chard and cooked corn will keep up to 4 days in the refrigerator, and cooked gratin will keep for 3 to 4 days. Your kids surely have to eat beets if they are smothered in GLAZE!!! 1 Preheat oven to 400°F. Line a roasting pan with aluminum foil. Place the beets in the pan. Rub olive oil over the beets, and sprinkle with salt. Cover the beets with another sheet of aluminum foil. Roast for 1 to 2 hours, depending on the size of the beets and how old they are. After 1 hour, test every fifteen minutes by poking a beet with the tines of a fork. Once the fork tines go in easily, the beets are tender and cooked. Remove from the oven. 2 While the beets are cooling, prepare the balsamic glaze. In a small, shallow sauté pan, add the balsamic vinegar and sugar. Heat on high until the vinegar has reduced to a syrup consistency. Remove from heat. 3 After the beets have cooled for several minutes, but are still warm to the touch, peel off the outer skins and discard. Cut the beets into quarters or more, bite-sized pieces. 4 Place beets in a serving bowl. Pour balsamic glaze over the beets. Stir in grated orange zest, and add salt and pepper to taste. Garnish with a little orange zest to serve. rests in his beauty at the water, and the great heron feeds. Posted 9/14/2015 3:15pm by Josie Hart. Just a friendly reminder that tomorrow at distribution we will have our favorite partner - Locavore Delivery visiting the CSA!! Local, grass-fed beef, heritage pork/delicious bacon and salmon fillets are just a few items Jay will be selling tomorrow at distribution. Cash, check or cards accepted. We also will have fresh cut bouquets for only a few more weeks! Get yours while you can! Honey is back this week with more quarts, pints and half-pints. Prices are the same: $20, $10, $5 please bring cash or check for all these goodies! Thanks everyone! Here's to a yummy week of fresh veggies, fruit, meat and honey!!! Posted 9/11/2015 3:32pm by Josie Hart. We hope you are ready for another week of bounty! Keep in mind the honey this season is plentiful and we will have several weeks of honey to go around for everyone. They bottle each batch fresh out of the hive so there is a limited amount in the beginning phases. Shareholder gleaning day (come and harvest your own crops)! Next Sunday, Sep. 20 from 10 a.m. to noon. Please bring your own tools and bags. There will be staff onsite to show you which crops can be harvested. There will be signs marking the row you can pick from but please do not pick crops that are not flagged as we are still working with big portions of the field. Park in the Visitor Center lot and walk through the park, (you will head through our washstand area and out onto the dirt road. Pass the "staff only" sign past the pond, past the beehives and turn left into the gate. Roast the tomatillos, a few cloves of garlic and bell peppers in a shallow roasting pan. Cover the bottom with water, a splash of oil and salt/pepper. For the next 20 minutes, roast until soft. Place the cooked tomatillos and bell peppers, lime juice, onions, cilantro, chili peppers, sugar (if using) in a blender or food processor and pulse until all ingredients are finely chopped and mixed. Season to taste with salt. Cool in refrigerator. Posted 9/8/2015 11:19am by Josie Hart. We hope you are enjoying the melons from last week. This season's winners for me so far has been the striped German tomato (the huge light yellow and orange heirloom) and the lemon cucumbers! They make a great combo - instead of a caprese salad, slice up some fresh tomatoes and layer them on slices of cucumber with olive oil, a splash of chopped cilantro and fresh ground salt/pepper. *Coming up for the fall: cabbage (red, napa, green) broccoli, collards, winter squash and leeks! The fruit share will be transitioning from peaches to apples and finally to cider and apple butter. We will continue to have occasional fresh mushrooms and gorgeous fresh flowers for sale as well. Yes the honey this year is more plentiful than usual (this year our beekeepers harvested close to 600 pounds and usually they harvest 400). Please do your best to bring exact change with you. If you do not get honey this week, we will have more opportunities in the future weeks. The honey is raw and straight from the comb. We are currently not selling sauce tomatoes but as we slow down on tomatoes we may have a limited number of seconds tomatoes for sale next week depending on how harvest goes Monday and Tuesday. If you are interested in seconds tomatoes for sauce (these are bruised and overly ripe tomatoes that you can cut up for sauce or soups) we will have a limited number for sale starting next week. In a medium salad bowl, stir together the lemon juice, sugar, olive oil, salt, and pepper until the sugar is dissolved. Add the salad greens - if you are using kale, shred the kale and let it sit if you can 20 minutes. Then massage the kale, tenderize it by gently beating it with a spoon. Don't do this with salad greens or arugula! Then add the diced mint, and cucumber to the bowl and toss together. Okay enough with the constantly healthy CSA recipes! Lets get fried! Just a few minutes - and a handful of ingredients - to fritter greatness! These simple summertime fritters are the perfect way to make use of this prolific yellow squash. In a medium bowl, toss together the grated squash and the salt. Line a fine-mesh sieve with several layers of paper towels or cheesecloth. Add salted squash to the sieve and place over a bowl to drain. Let sit for five minutes then gather up the sides of paper towels or cheesecloth and gently squeeze the liquid out of the squash (there will probably be quite a bit). Add the egg to a medium bowl and beat lightly with a fork. Add the flour, basil, onion, black pepper, and the squash. Stir with fork to combine. Place a large skillet over medium heat. Add 1 - 2 tablespoons of olive oil, enough to lightly coat most of the bottom of the skillet. Once the oil is hot, add fritter mixture to pan in approximately 2 tablespoon increments, working quickly to spread the fritter into a round shape before it begins to cook. I usually cook 3 fritters at a time; any more and the pan gets crowded and it's hard to manage them all. Cook for 1-2 minutes, until golden brown, and flip to cook the other side until golden and the fritter is cooked through, about 1-2 more minutes. Transfer to a paper-towel-lined plate. Add more oil to the pan and repeat with remaining batter. To make the sour cream topping, add the sour cream, zest, juice, and salt to a bowl and stir to combine. Serve fritters right away, topped with a drizzle of lemony sour cream and garnish with basil leaves if desired. Thank you for all your support of our farm and local farmers. Here's to great food and to the bounty of summer! Posted 8/28/2015 3:22pm by Josie Hart. Wow, what great produce we had last week! Watching everyone leave distribution on Tuesday and Thursday was something to remember. There were peaches, eggs, greens, vivid tomatoes and interesting veggie shapes in the hands of many smiling people. What did you prepare with your bounty? Email your recipes and we will send them out so everyone can share your ideas. Just a reminder, Tuesday's pick-up is back at York Street, and will be for the rest of the season. This is a recipe adapted by True Roots Farm from the cookbook "Plenty More," written by London chef Yotom Ottolenghi. The ingredients here are favorites and this recipe is daring, yet simple and really quite delicious. Wash and de-stem beets. Wrap in foil and place in a 400º oven. Roast for 30-40 min, until easily pierced by fork. Let cool slightly. Slice or chunk. Place in a large bowl. Add the onion, vinegar, oil, sugar, chili sauce, 1 tsp salt and some black pepper. Toss gently. Top with avocado slices, cilantro, mint, peas and salad greens. Toss lightly again, and finish with a drizzle of olive oil. Thanks to our Chatfield farmers who among a million things, have been working to make our Veteran Reintegration Program a success! A special thank you to Jamie Wickler and Chris Krabbenhoeft who are responsible for the weekly classes we offer on various sustainable agriculture topics. This is the first season we have partnered with Veterans to Farmers to offer post 9-11 veterans the opportunity to learn about farming, marketing produce, farm stands in food deserts, horticulture and public gardens. Here are most of the graduates from our very first educational farming program here at Chatfeild Farms standing with our Market Grower, Chris Krabbenheoft. Posted 7/9/2015 2:28pm by Josie Hart. As a quick reminder, we have a limited amount of fresh cut farm bouquets for sale! No where in Denver will you find such beautiful bouquets for only five dollars each! Help support Chatfield by purchasing a bouquet today! We accept cash or check or if you forget you can do an IOU. See you at 4 -7p.m.! Posted 7/7/2015 1:03pm by Josie Hart-Genter. Farm-fresh cut flowers for sale! $5 You won't find flowers these beautiful anywhere in Denver for only $5! Please support the Chatfield Farms by purchasing a cute Mason jar bouquet today - limited supply. Until our plants size up a bit leaving the rubber band on the stems helps keep it together. Please bring cash or check. See you at St. John's! Posted 7/6/2015 11:58am by Josie Hart-Genter. We hope you all had a great holiday weekend! We apologize for sending our newsletter out a bit late - we were unsure with the sporadic weather what was going to be ready. Every day on the farm lately has been very dynamic! We hope you all enjoyed the fresh garlic we handed out last week - what an amazing and potent flavor burst! **no fruit share this week - later in July! 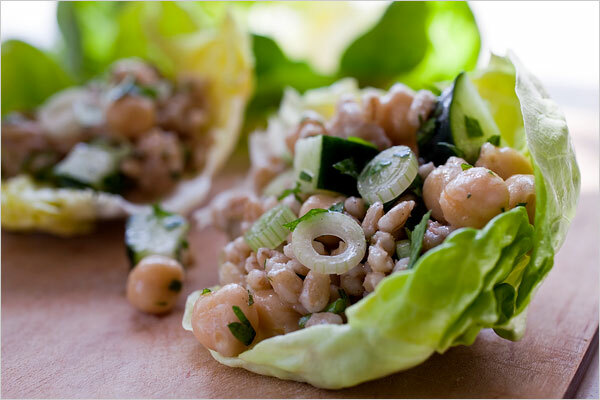 Bulgur and chickpeas have complementary amino acids, so this lemony salad offers you a complete protein package. You can prepare coarse bulgur by simmering it or by soaking it. Simmering will yield a softer, fluffier grain — and bigger portions. 1. For coarse bulgur: Bring the water to a boil in a medium saucepan. Add the bulgur and salt to taste, reduce the heat, cover and simmer 20 minutes or until the water is absorbed. Remove from the heat, and allow to sit undisturbed for 10 minutes. For medium bulgur: Place the bulgur in a bowl with 1/2 teaspoon salt and pour on 2 cups hot or boiling water. Allow to sit for 20 to 25 minutes, until most of the water is absorbed. Drain and squeeze out the water. 2. Meanwhile, mix together the lemon juice and cinnamon, and salt to taste. Whisk in the olive oil. Toss with the bulgur in a bowl. Add the remaining ingredients, toss together, taste and adjust seasonings. Serve with small leaves from the heart of a head of lettuce. Use the leaves as scoops. Enjoy watching the sun set over the foothills at Chatfield while you listen to great live music. Chatfield celebrates the 80s and 90s with Culture Club; Under The Sun Tour with Sugar Ray, Better Than Ezra, Uncle Kracker and Eve 6; and Yes + Toto. Culture Club, Monday, July 20, 6:30 p.m. Under the Sun, Tuesday, July 28, 6 p.m. Yes + Toto, Sunday, August 30, 5:30 p.m. Gates open an hour and a half before show time.